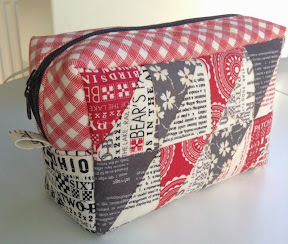 I've loved looking through the Patchwork Please book and so a couple of months ago I attempted the Box Pouch using a Moda Scrap Bag. 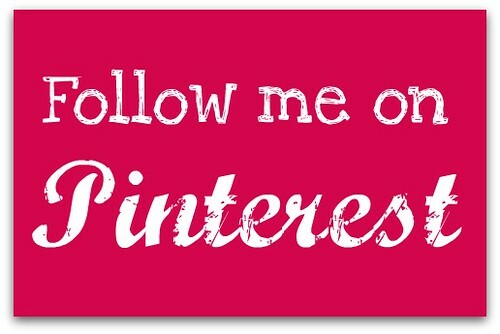 There was a sew along when the book first came out and so there was some advice on various blogs. Some said they made it without many problems ... But I found it quite difficult to make. 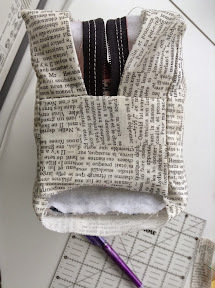 The book says that there is a 1/2" seam allowance, but the triangle pattern has a 1/4" seam. I sewed all of it with 1/4", this was probably where I went wrong! 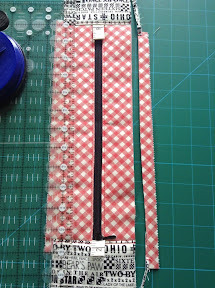 I wasn't sure how to attach the top zip panel to the sides, but Alyce from Blossom Heart Quilts explains on her blog that you sew it on the same as you mitre the corners when doing a quilt binding ... that then made sense. I left it the right way out for ages and it looked very nice ... But I couldn't use it. Then at the weekend I finally stitched an extra panel in the lining to fix this hole. It's still very badly fitting ... 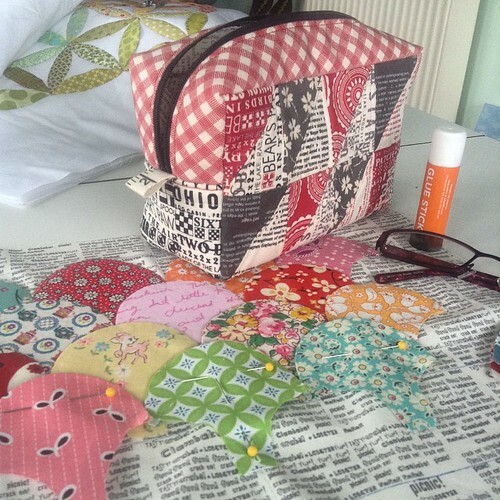 But once filled with stuff it is ok.
Today I went to "Stitch Club" and filled it with bits to finish the clamshell block for my Green Tea and Sweet Beans quilt .... Or Grean Beans and Rich Tea as we have been calling it! I love the boxy look of the bag, but I won't be making another one for a while. 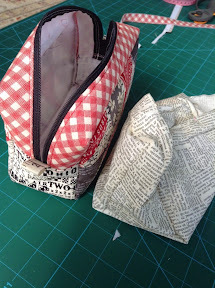 I will try out some of the other box pouch tutorials first. 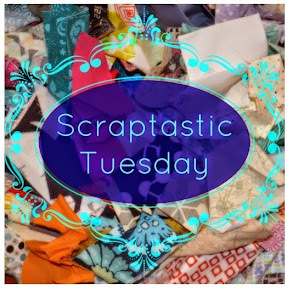 Linking up with #scraptastictuesday over on Leanne and Nicky's blogs. I really like your pouch, I think you call it a great success, and your clamshells are also lovely! It looks brilliant. Well done for persevering and like you say now that it's filled with stuff no one will ever know! I keep calling it Sweet Tea and Green Beans lol I'm glad you finished it in the end, I love a good pouch. It looks great even if it's not 100% correct. I don't think I'd have even tried it. The outside looks wonderful and stuffed with things nobody will ever notice the inside. It is hard to make a small thing like this for the first time and you will probably find it easier the next time you make a pouch. Your pouch looks lovely. You'd never guess you had problems with it! I followed the Zakka Along and had a really good time. I didn't make the pouch though, it sounds difficult. And thanks for the visit and entering my fabric giveaway!